Thanks Erik for the writeup. As you said in the post, we’re now really interested in getting people to test the system, either writing (in different languages) or translating, since there are so many language issues to develop further. Any kind of feedback will be most welcome! 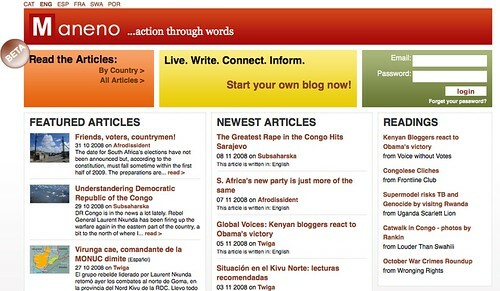 And one more thing that differentiates Maneno from other blogging platforms such as blogger or wordpress, which is self-evident but also important: the content focus, only on Sub-Saharan Africa. Wow. My connection here in Cairo is crawling today (I keep thinking I’m downloading some video or something, but I’m not), and Maneno loaded in a flash. It looks great too! Well done Maneno! I’m sitting in Norway thinking that this must be great. I haven’t experienced lag using gMail anywhere in the world, though I’ve had that experience with Hotmail, Yahoo, Apple Mail etc. But what if/when people in the West finds out about this service and want to start using it, say, when the Internett bottles up in 2010, and lines get slow everywhere due to congested traffic: Will there be a problem if westerners start using it? Here’s a question I forgot to ask. Does Maneno have plans to work in an Arabic translation? We’re open to having any languages spoken in Sub-Saharan Africa available, the more the better. That being said, with Arabic having a different script it’s going to take us a bit longer to suppport it. Volunteers to translate the site are welcome! Just contact us here and we’ll send the file that is just 1-2 pages of mostly short phrases. @Geir, one of the things that I learned about GMail in talking with some of their people is that if you open an account in say, Norway, they will set you up to be on a server as local to your geographic location as possible, perhaps in Oslo or London. Of course, if you’re start there and then say, visit the US for awhile, your account doesn’t get moved, which hopefully they and other providers of web-based applications will take in to consideration as some point. For our part, we’re trying to create a system that is as geographically independent as possible. I love GMail and use it for all my email, but I do so with the realization that when in Europe or Africa, I’m banished to the mobile version for any semblance of speed. I’m hoping that with Maneno, such sacrifices will simply not be needed and wherever someone is, the site will still perform nearly as optimally as anywhere else. On a related note, we’re currently running on a server that is less than amazing, but forces us to tweak it to run as fast as possible, which is great. Down the road, we’re going to host the platform on our own servers which will create a bigger speed jump as well. This is a wonderful idea. Having lightweight options for areas without reliable or heavy bandwidth is a necessity if things are ever going to be useful in remote areas. I think Maneno has great promise both in and out of Africa! I think that this is so spot on. So often developers forget that not everyone has the same access to bandwidth that we have in the USA. I split my time between SA and the USA and have serious issues in SA accessing many sites (some of which, like Kodak Gallery are actually blocked). You guys have a great idea here – simple and easy to use is the goal here. I always try to say that in Africa they need bulletin boards and forums and ways of sharing information for actual use – not just to read before you go to bed. This is also why I love Ushahidi because it recognizes the need for simplicity. So many devices being designed for the cellphone are also dependent on 3G to work. In Africa the story is different – simple but beautifully powerful. Great job Elia and gang. This looks like a fantastic project, I love the translation interface. They have managed to produce an Akan keyboard, and their newsletter comes in Akan and English, which is quite fun to read. I believe they are working on a translation engine, but for the latest information or collaboration opportunities, it might pay to send them an email using their contact form. What a find! I am amazed at how fast the pages load over our slow connections. The formatting options are limited at least for now, but then that’s a small price to pay for unloading so much overhead. I’ve started a copy of my blogspot blog there (at Computer Doc in Jos) and will see how it goes. I like the collection of African blogs there, too, but as the site grows I’m sure it will change from its “small town” feeling to something more impersonal. Hi Hash, Elia, and Erik: I asked Kaushal if he knew of a way to speed up WordPress blogs in Africa to help my cousin who is blogging from northern Uganda. Kaushal referred me to you and Maneno. Wow, Maneno indeed is a great platform: I’ll pass the info on. Question: is it possible to transfer existing WordPress data files to Maneno? Or do you have to start a Maneno blog from scratch? Thank you for your reply. Well, it depends on the size of the source blog. If it’s a small blog, we could probably help cut and paste it in if he’d really like to use it. At some point, I’d like to create a database mapping tool so that you could create a dump from WordPress or Blogger and just transpose it in to Maneno. The only issue in this is time of course. If you have any other questions feel free to email me: my name at maneno.org Sorry for the delayed response, but I apparently wasn’t set to receive notifications to new comments on this point. Hopefully I’ve fixed that now. Thanks for the info, Miguel! masticable » Maneno: Â¿QuÃ© dice Ãfrica?